This is important in a couple of ways. The described development way – compilation of a C/C++ with Emscripten – could be one way to go to develop games or virtual world environments in the browser (as opposed to written in JS directly). I learned in the Google Creative Sandbox in Berlin that Google sees the Chrome browser more and more as a multimedia engine to run creative applications – like games. That’s why they are incorporating things like WebGL and the Mouse Lock API. Obviously Mozilla/Firefox agrees. I’ll go into more detail for this last bullet. It is lightening fast on current hardware and runs great even on older hardware because it uses a cube based, oct-tree approach to render the world. 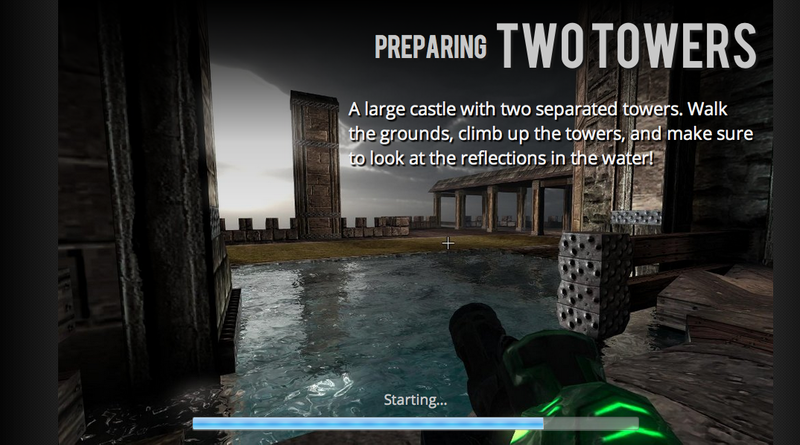 It’s a multiplayer game with real-time editing abilities. Now let’s look at the first issue: the cube based approach. If that sounds familiar – that’s right. That’s the same approach that Mojangs Minecraft uses. Also the second bullet – multiplayer editing – is a feature of Minecraft: in fact the multiplayer editing feature is what makes most of the fun (according to personal observations and some relatives ;-) ). I am not stressing this to tell somebody ripped the concept of somebody else, rather the opposite: we can learn from both concepts to create better virtual worlds. To me, Minecraft today seems to be as close to virtual world immersion as it gets, with its incredibly easy user interface and the fantastic crafting notion. Sauerbraten, on the other hand, features more realistic graphics, although using the same blocky approach. Also it’s open source. Both have clients for Windows, Mac OSX and Linux using a completely different approach (Java vs. C++). With virtual worlds being at an all time low (see the Gartner Hype Cycle 2012 discussed in Wagner James Aus NWN ) we need to learn from these concepts to do it better next time – and there will be a next time. With the WebGL translation of Sauerbraten, I can’t help but stress there are ways to create a multi-plattform, multi-device approach for games and virtual worlds – even within the browser. There’s tons of ressources and mods out there. I’d like to point out the excellent (albeit german) ressources at Natenoms Blog with a very friendly user community, explaining important more advanced features like mumble integration (i.e. VoIP support in Cube 2). This entry was posted on Sunday, September 9th, 2012 at 6:42 pm and is filed under Uncategorized. You can follow any responses to this entry through the RSS 2.0 feed. You can leave a response, or trackback from your own site. Thank you! I remember this project but wasn’t sure if it is under active development. Your comment seems to prove it is? :-) i will check this out – thanks again. Hi there, I am one of the people working on BananaBread. I’d love to work with people that want to make a more virtual worlds thing with this technology – basically doing as you said, starting with Cube 2 or Sandbox, using the BananaBread HTML 5 on that, and adding virtual worlds features. There is a lot of potential in that approach, if people want to work on it. Thanks for this Dirk! I didn’t know this existed and it’s pretty cool. I’m hoping to make friends and collaborators working on Cube 2 projects; it’d be wonderful if code got written to allow for a dialog and quest system, along with an AI to make story arcs and action triggers a bit smarter :) I’d love to get some mail on this!